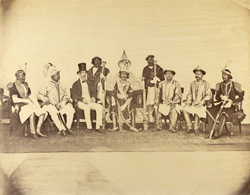 Photograph of the King of Nepal and other members of a darbar or meeting; part of a collection of albumen prints taken by Clarence Comyn Taylor between 1863-65, which constitute the earliest photographs of Nepal. Taylor, a soldier in the East India Company's army, was badly wounded in the Indian Uprising of 1857 and turned to Political Service, arriving in Kathmandu in 1863 as Assistant Resident. At this time the British had started a project to document the people and monuments of the Indian sub-continent using photography. Taylor fortuitously was a capable photographer and took images of Nepal for the Government of India. No XVIII in Taylor's List of pictures, this image shows the King of Nepal, Maharaj Dhiraj Surendra Bikram Sah, (ruled 1846-81), Col George Ramsay, the British Resident, who represented the Government of India as Ambassador (Nepal was otherwise closed to Europeans), is on the King's right. Raj Guru, the chief Hindu priest of Nepal, is on the King's left. Sitting on Colonel Ramsay's right is one of Jang Bahadur's brothers, probably Jagat Shamsher.